The vibrant UNCG Orchestra program has long been recognized for performance excellence, adventurous programming, and high artistic standards. A diversity of offerings allow students the opportunity to perform repertoire for ensembles ranging from the largest cornerstone and contemporary works for full orchestra, to intimate pieces for chamber orchestra, to string orchestra. Students in the UNCG Orchestra program are dedicated to the performance, study and cultivation of orchestral music of the highest quality. 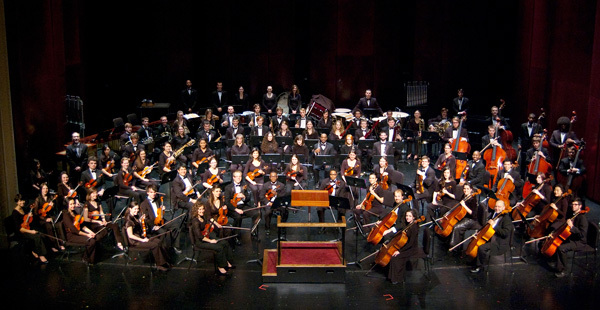 The UNCG Orchestras offer outstanding performances throughout the year and enhance the institutional spirit and community of UNCG. We seek to promote music education in the state of North Carolina and in our region by supporting secondary school orchestra programs and other organizations through our outreach activities and other annual events on campus.